Christmas is no time to take chances. You need some classic recipes that you can rely on to deliver the results that you and your guests are looking for. Plan your Christmas lunch around these tried and tested recipes and you cannot fail to please your guests! On Christmas Day remove the turkey and stuffing from the fridge - the turkey should have been defrosted and the stuffing already prepared. Combine the breadcrumbs with the garlic, Italian herbs and melted butter and season. Gently push your hand under the skin covering the turkey breast and cover the breast meat with the bread crumb mix. Peel the orange and cut it up into quarters. Then place these segments, together with the bay leaves, in the cavity. Tie the legs of the turkey with string. Stuff the neck flap with the stuffing and secure with a cocktail stick. Preheat the oven to 190°C. Pour brandy into a baking tin and place the turkey in the tin. Cover the whole roasting tin with a layer of foil. Roast the turkey for 2 hours then remove the foil and increase the heat to 200°C. Cook for a further 35 minutes. Check the turkey is cooked by piercing the thigh with a knife. The juices should run clear. If they don't put it back in the oven for at least another 15 minutes. Once cooked, take the turkey out of the oven and let it rest for 35 minutes before carving. 1.8kg King Edward potatoes, peeled and cut into large, even-sized pieces. Preheat oven to 200°C. Please potatoes in a large pan and just cover with water. Put on the lid and bring to the boil, then simmer for 5 minutes. Drain and shake in a colander to fluff up the edges. Pour the oil into a large roasting tin and heat on the hob. Carefully arrange the potatoes in one layer in the tin - the oil should be so hot that it sizzles when the potatoes go in. Turn them so that they are evenly coated in oil and roast for 40 minutes, turning halfway through cooking. Drain off the oil and season with salt. Cook for a further 5 minutes. Jazz up Brussel sprouts with some caraway seeds to add extra crunch and flavour. On Christmas Eve, cook sprouts in salted boiling water for 3 minutes. Drain and refresh in a bowl of iced water. Drain, cover and chill. On the day, melt butter in a pan. Add seeds and let them colour for 1 minute before stirring in sprouts. Up the heat and add vermouth. Cook for 1 minute on a high heat. These fresh vegetables lighten the load at the dinner table and add some colour to the spread. On Christmas Eve, stir the garlic, parsley and lemon zest into the softened butter. Cover and chill in the fridge. On Christmas Day, when you're almost ready to serve everything, cook the carrots and beans in a pan of salted boiling water for 4 minutes. Strain, then toss into a serving bowl with the flavoured butter. A turkey would be empty - literally - without the addition of stuffing. It adds a certain sweetness to the occasionally dry white meat. On Christmas Eve, make the stuffing by combining all the ingredients and cover and chill. On Christmas Day, use some of the mixture to stuff the turkey and shape the leftover mixture into golf sized balls. Cook for 30 minutes until golden and serve. Cut the bacon rashers in half lengthways and wrap around the chipolatas, pushing a little thyme sprig into each bundle. Place the chipolatas in a roasting tin lined with greaseproof paper. Scatter over a handful of thyme. Why do we reserve these rich flavoured treats for just Christmas? Mince pies are the perfect balance of sweetness and always a delight to indulge in. Cut the butter into cubes. Sift the flour into a mixing bowl. Add the butter and, using your fingertips, rub the butter into the flour until it resembles fine breadcrumbs. Stir in the icing sugar. Make a well in the centre; stir in the egg yolk and about 3-4 tbsp iced water to make a soft dough. Knead lightly to form a smooth dough Preheat oven to mark 400F or gas mark 6. On a floured surface, roll out two thirds of the dough and cut out 30 rounds using a 2-½ inch fluted cutter. Use to line the bun tins. Fill with the mincemeat. Re-roll remaining pastry and trimmings and cut out circles using a 2inch cutter. Dampen edges of circle and place on pies. Seal edges, brush tops with beaten egg and cook for 20 minutes. 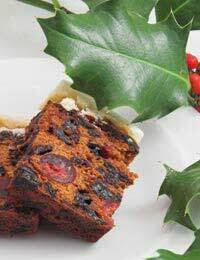 Remember that traditional Christmas fruitcakes are best made well in advance - at the end of October or beginning of November. So act fast! Next day, heat oven to 140°C. Place butter and sugar in a large bowl and beat with an electric mixer until pale and fluffy. Beat in eggs, one at a time, beating well between each addition. Decorate surface with whole almonds. Bake for 3 to 3½ hours or until an inserted skewer comes out clean. If necessary, cover loosely with foil part way through cooking to prevent over-browning. Cool in cake tin for 1 hour, then remove to a wire rack to cool completely.